SB1295 would create a special Class 5 felony for subjecting pets to cruel mistreatment. And the same penalty would apply for killing a pet without the owner’s consent. For the second time in two years, state lawmakers are voting to increase the amount of money they can take from private donors. Republican critics of Clean Elections have renewed their long-term goal of convincing voters to repeal Arizona’s system of public campaign funding and are hoping that some extra money for K-12 education will help sweeten the deal. Homeland Security Secretary Janet Napolitano told a Senate committee Wednesday that the border is as secure as ever and it should not be an impediment to the comprehensive immigration reform. Severely wounded and still recovering, former Rep. Gabrielle Giffords begged lawmakers at an emotional hearing Wednesday to act quickly to curb firearms because "Americans are counting on you." Not everyone agreed, underscoring the national political divide over gun control. 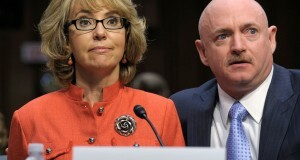 Wounded former Rep. Gabrielle Giffords will appear as an unscheduled witness Wednesday at the year's first congressional hearing on curbing gun violence, adding drama to a session that was already slated to hear from a top official of the National Rifle Association.